Beautiful house for 8 people, very cozy and decorated with country style, is located in a fantastic wine complex perfect for two families with a nice patio for summer evenings. The two houses are fully equipped, distributed in both in ground floor with independent access, respecting the privacy with the other guests. The beautiful swimming pool, soccer field, gardens and play area with pim-pom and futbolin will make your family enjoy a very nice holidays. Subirats surrounded by vineyards offers a special tranquility, just 4 km. Of Sant Sadurni d'Anoia, city considered as capital of the Cava, you will find all the necessary services so that you do not miss anything during the holidays. In the month of September in full vintage the customers are invited to participate in the unique experience. 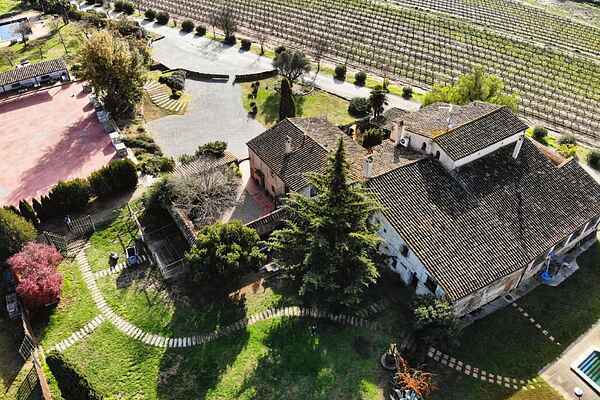 Included in the stay there is a visit and tasting to one of the wineries in the area.